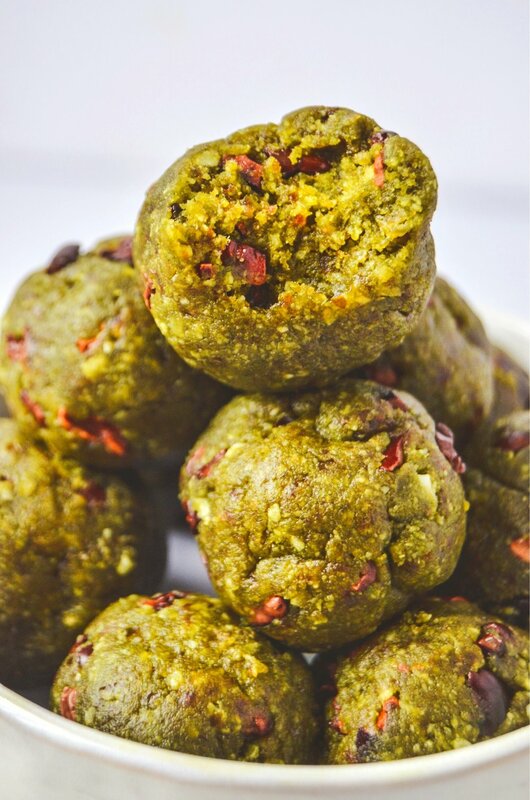 A tiny burst full of superfood energy! Dairy-free, gluten-free, vegan, paleo friendly, and naturally sweetened. Matcha to me is like a fine wine. I only want to drink it during those special occasions when the timing is just right. Matcha is also not the cheapest thing in the world so you can probably see where I’m going with this but in all reality, I cherish the benefits and the robust flavor that goes along with it. You see, matcha comes from the same plant as green tea but since it is made from the entire leaf, it packs in a more concentrated amount of antioxidants and beneficial plant compounds. Matcha powder can stand on its own, but why we can take it up a notch by adding cordyceps mushrooms, ashwagandha, ginger, and wheatgrass. Okay, let’s pause. I’m sure some of you are asking, “What the heck are these ingredients and why are we adding them”? Cordyceps Mushrooms: Improves energy, endurance, and strength while helping to reduce fatigue. Ashwagandha: An herb that can reduce anxiety and stress, help fight depression, boost fertility and may even boost brain function. Ginger: A spice that is beneficial for people with indigestion and related stomach discomfort. Wheatgrass: Is prepared from the freshly sprouted leaves of the common wheat plant, Triticum aestivum. Benefits include weight loss, decreased inflammation, lower cholesterol and better blood sugar control. So, wouldn’t that taste like dirt? 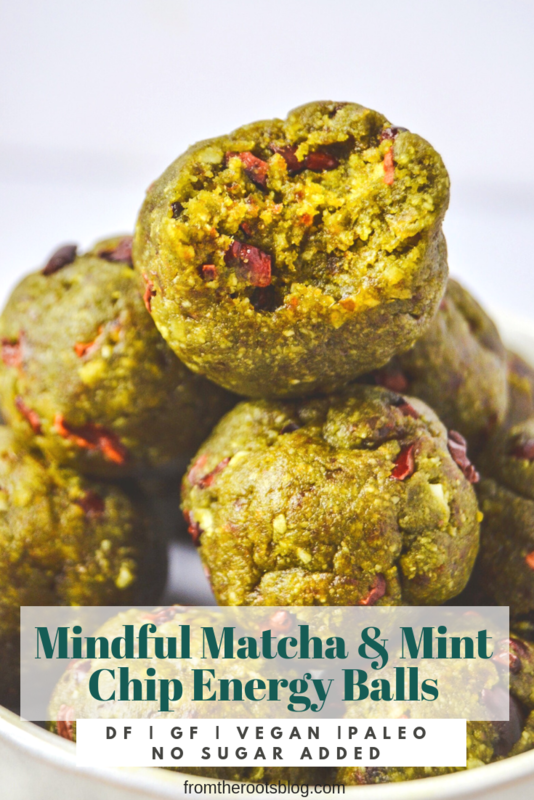 I thought the same thing until I used Further Food ‘s mindful matcha powder. The matcha flavor that I love so much masks the earthy flavor of the superfood ingredients, making this powder adaptogenic (herbal pharmaceutical) and superfood enriched! If you are interested in trying their matcha powder, use fromtherootsblog10 for 10% off your first order! 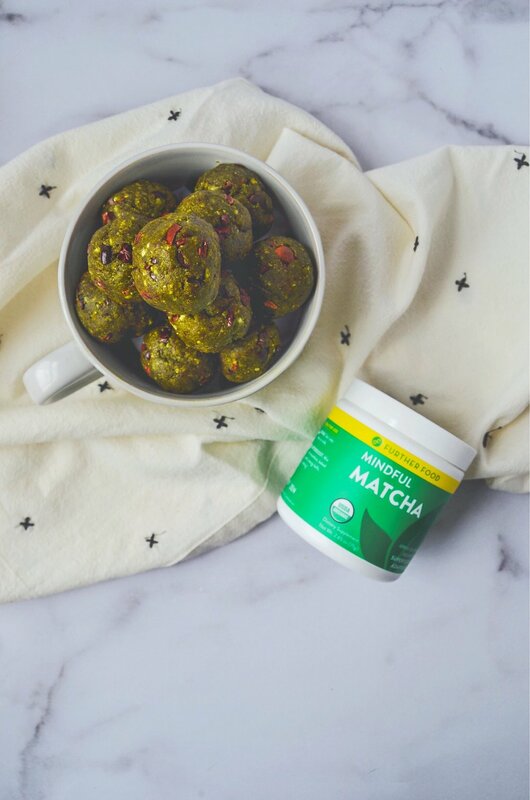 Matcha can stand on its own, but combining matcha with mint and chocolate really takes these energy balls to a new level. Peppermint extract and cacao nibs really bring out the refreshing tones of matcha while being naturally sweetened with medjool dates. I love knowing that I can treat myself to these first thing in the morning for that burst of refreshing energy or have one as an afternoon or pre-workout snack. Matcha obsessed? 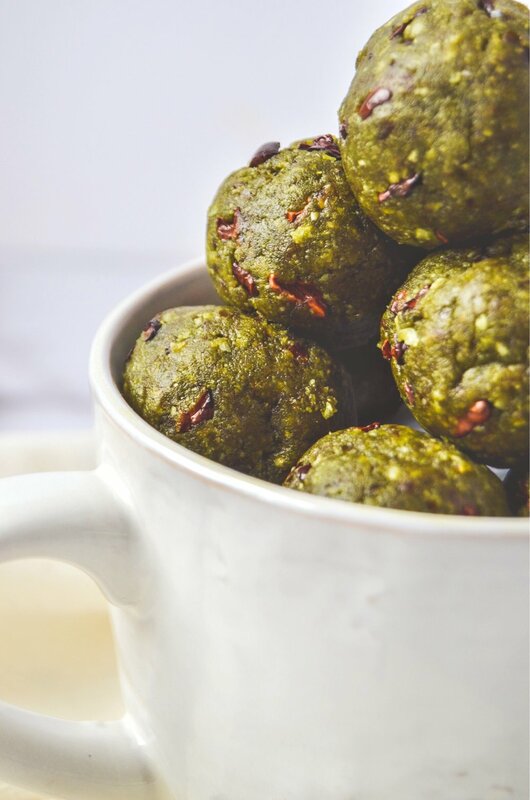 Check out these matcha and carob cookies. I was not financially compensated for this post. All recipes, photos, and opinions are my own. To a food processor or high powered blender, blend medjool dates until the dates form into a ball. Scoop out and set aside. To the food processor, add the rest of the ingredients except the cacao nibs and blend until a fine meal is achieved - about 20-30 seconds. Add the dates back in and blend until fully incorporated: not crumbly, not tacky, but more mold-able. If the mixture is too dry, add 1 tsp water in increments. Be sure to taste the dough for desired flavor. Personally, I like to add more peppermint extract to the dough. Take the mixture out of the processor and transfer to a small bowl. Fold in cacao nibs or chocolate chips. Scoop out 1 tablespoon amount and form into a ball. Repeat until all dough is formed into balls. Chill in refrigerator for 10-15 minutes before serving. Store leftovers in an airtight container for up to a week in the refrigerator or freezer for up to 1 month.